10 Basic Rules For Dry Stacked Walls - Pebble Junction, Inc.
You need to start your wall 3" - 6" below grade so that it cannot be shifted at its base. A strong wall neds to be laid much like a brick wall - always one over two, two over one. 3. Give the wall batter. 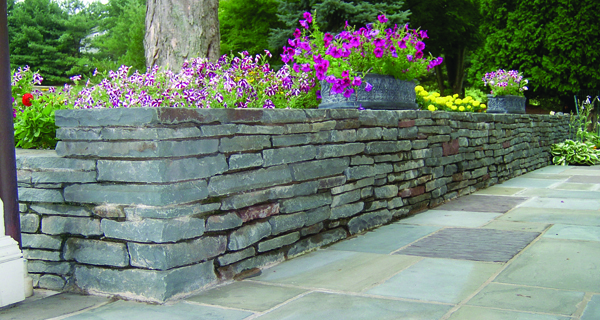 Retaining walls need to have a ceratain amount of pitchback - or batter - about 1" back for every 12" of height. This rule applies only to retaining walls, but accent walls also benefit aesthetically and, to a degree, structurally from this construction technique. 4. Use tie through stones. These are stones that go all the way through the wall to help bind it together. They should be spaced approximately 2 feet apart throughout the wall. 5. Always pitch stones toward the center of the wall. Be sure your stones either lie flat or pitch back. If they pitch out, they will cause the stones on top of them to slide outward and destroy your wall. 6. Larger Stones on the bottom. It just makes sense that larger stones should be on the bottom of a drywall for a strong base. Exceptions would be the tie through stones and cap stones, which will help structurally. 2. They keep out moisture and eliminate frost damage. 8. Choose the correct face on the stone. Every stone can be laid in a dry stacked wall, you just need to see its face. 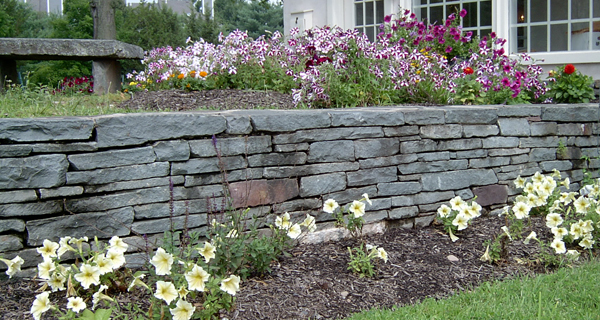 In a dry stacked wall, the stones always lie down flat, so generally the face is the largest flattest edge. Seeing the right face in a large pile of stones takes some degree of experience. 9. Fill center with stones and dirt. The center of the wall needs to be laid with fairly tight fitting stones and then leveled off with dirt. 10. Fill cracks in the face with slivers. After your wall is complete, fill any cracks in the face with small slivers or chips to help tighten the wall and increase its structural integrity.